On April 2, 2014 the STEM Learning and Resource Center (STELAR) hosted an outreach event to introduce the goals of STELAR, celebrate the launch of our website, and to make new connections in conjunction with the NSTA conference in Boston. Participants were new to the ITEST community and joined the event to learn more about STELAR and the ITEST program. Attendees were introduced to the ITEST program and to STELAR’s goals to support the research and innovative program development that ITEST projects engage in. They learned how STELAR will be sharing findings from the ITEST program via the newly unveiled STELAR website and the support available to ITEST projects working to prepare youth for educational pathways and careers in STEM. 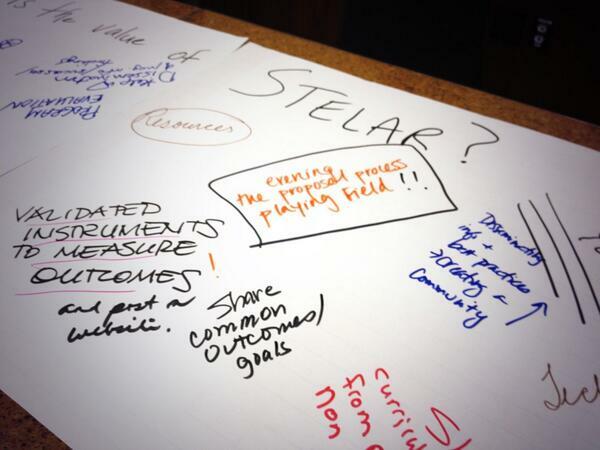 Attendees reflected on the value of STELAR to both their organizations and to stakeholders in their networks. These reflections included helping connect programs to potential collaborators for proposal development, sharing evaluation instruments, disseminating best practices, and supporting a community of practice focused on building understanding of best practices, contexts, and processes contributing to K-12 students motivation and participation in STEM.